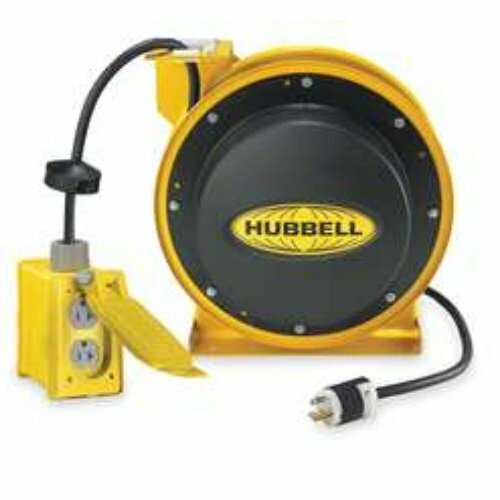 Hubbell industrial power cord reel with Twist-Lock connector. Industrial cord reels are built to provide safe, convenient power and lighting for demanding industrial applications and environments. The industrial reels are all steel construction, have a 125V rating with SJ cord and can be ceiling, wall or bench mount. Multi-position guide arm. Positive-latch mechanism automatically maintains desired cord length. 12 AWG cord for greater current carrying capacity. Durable, corrosion resistant steel construction with design yellow powder coat finish. Plug-in 5-feet long power cord requires no electrical wiring. Listings and certifications: UL 355/CSA C22.2 No. 21. Operation: dry, indoor, non-hazardous locations. 12/3 SJEO cable type. L5-20R NEMA style. 45-feet cable length.